Beans and rice are a staple in the diets of many people across the world, particularly in Central and South America and the Caribbean. Nutritionally, they offer a dish that is high in protein, low in fat, rich in fiber and a good source of carbohydrates. They are also cheap and can be very tasty as well. This dynamic duo goes together with just about any meat. 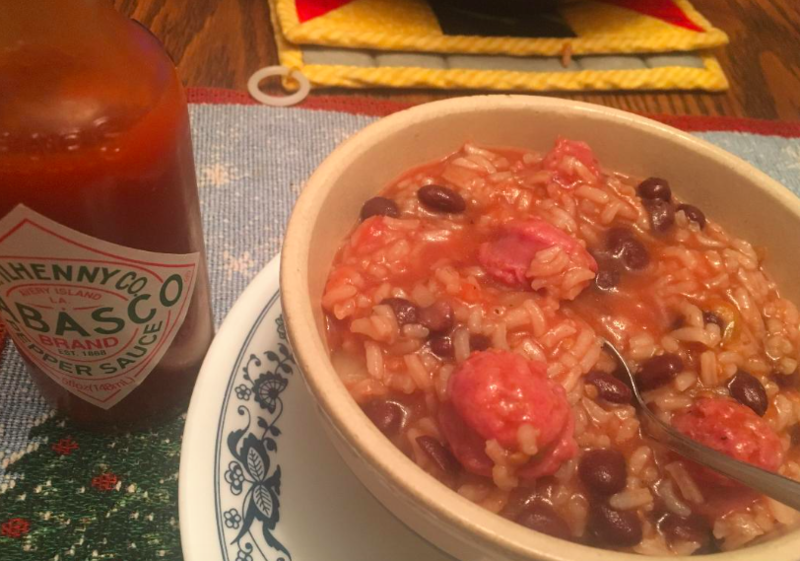 One of my go-to meats that I combine with beans and rice is sausage. Gumbo and jambalaya, which are popular in the Cajun and Creole cuisines of New Orleans, are two dishes that are among my favorites, but I’m always on the lookout for more recipes that fit the bill. The other day, I satisfied my craving for that trio with the following recipe, which was a revision of one found in my vast cookbook collection. Whatever your reason for eating beans and rice, you can’t go wrong. In a large skillet with lid, heat oil on medium heat. Add onion and garlic. Sauté until soft. Add sausage and Cajun seasoning. Once sausage is slightly brown, add tomatoes and black beans. Stir until just combined. Add chicken broth, water and rice to skillet. Stir until combined. Bring to a boil, cover and reduce heat to a simmer. Cook until rice is cooked through and mixture is thickened slightly. Notes: A small chopped-up bell pepper can be added to this dish. Or if you like things a little hotter, use a diced jalapeño or Hungarian wax pepper instead. I also like ringed sausage made in Langdon, N.D., that is available in some grocery stores in North Dakota and northwest Minnesota.